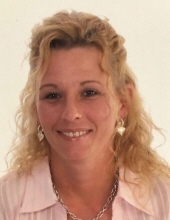 Jamie Lynn Wallace, 48, of Cleveland passed away Friday April 5, 2019 in Humble, Texas. Jamie was born December 20, 1970 in Dayton, Texas to her parents, Donald Wallace and JoeAnn Noe. Jamie was a DC technician for a telecommunications company. She loved gardening and time spent outside. Jamie enjoyed riding her Harley Davidson and relaxing in front of a big bonfire with her family and friends. Jamie especially treasured time spent playing with her grandkids. She will be missed by those who knew and loved her. Ms. Wallace is survived by her spouse, Dave Ozbolt; parents, Donald Wallace and Joeann Gutierrez and husband, Michael; sons, Stephen Wilson and wife, Amanda, and Cody Ozbolt; Charissa Jones and husband,Michael and Olivia Ozbolt; sisters, Donna Wallace, Kayce Wallace; grandchildren, Emma Addison, Kennedy and Lincoln Wilson and Brayden and Makenzie Jones; Nephew, Ethan Jares and nieces, Shalee Wallace and Keera Jones. A Memorial Service for Jamie will be 4:00 p.m., Saturday, April 13th at her home in Cleveland. To send flowers or a remembrance gift to the family of Jamie Lynn Wallace, please visit our Tribute Store. "Email Address" would like to share the life celebration of Jamie Lynn Wallace. Click on the "link" to go to share a favorite memory or leave a condolence message for the family.